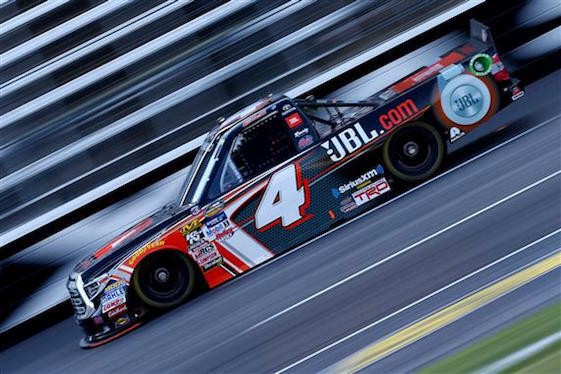 Oklahoma native Christopher Bell collected the Camping World Truck Series victory in Texas on Friday. Bell edged Chase Briscoe after a side-by-side, closing-laps battle to win the 21st annual winstaronlinegaming.com 400 NASCAR Camping World Truck Series race. Bell, who started 21st in the 28-truck field, won under caution after a violent white-flag wreck involving Timothy Peters, Austin Self and Johnny Sauter on TMS’ repaved and re-profiled 1.5-mile oval. A 22-year-old native of Norman, Okla., who calls TMS his home track, Bell earned his first win at TMS, second of 2017 and fourth of his 37-race NCWTS career. As Bell and Briscoe raced side-by-side for the win after a restart on Lap 166, Self’s No. 22 Don’t Mess With Texas Toyota spun and initiated contact with Peters exiting the dogleg and heading down the track’s frontstretch. Peters’ No. 99 Metabo Chevrolet Silverado spun and caught the infield grass, sending it tumbling and bouncing on the pavement. The No. 99 wound up on its top, with track safety workers needing several minutes to extricate Peters once the wreckage was turned over. Peters, a former series regular making his first start of the season, was checked at the track’s infield care center and released. Briscoe, who drives for Brad Keselowski Racing, was seeking his first series win and first for Ford this season. It appeared he was going to accomplish both after he took the lead from Bell on a restart following the night’s eighth caution from Laps 155-159. NASCAR’s scoring loop system determined Briscoe was in the lead on Lap 160 of 167 and when the yellow again flew on Lap 161 for a three-truck incident in Turn 4. When the green flew on Lap 166, Bell was able to edge Briscoe for the lead as the wreck unfolded behind them. Grant Enfinger finished third in the No. 98 Jive Toyota for his first top-10 finish at TMS. Ryan Truex was fourth in the No. 16 H.E.B. Grocery Store Toyota. Ben Rhodes rounded out the top-five in the No. 27 Safelite Auto Glass Tundra. Bell began the night 52 points behind Sauter in the championship standings. The reigning series champion, Sauter finished eighth in the No. 21 Allegiant Travel Chevy and saw his lead over Bell trimmed to 40 points. Accompanied by crew chief Ryan Fugle and wearing the winner’s white cowboy hat, Bell exited Texas with a smile after his second win and sixth top-10 of 2017. “Yeah, this place has got a special place in my heart,” Bell said of TMS. “Home’s only a couple hours up the road and we raced down here a lot with the Micro Sprints at Devil’s Bowl Speedway (in Mesquite) and Kennedale (Raceway Park). So ran a lot of races down in this area, but obviously never ran at the Texas Motor Speedway and didn’t really feel like it was a possibility to race at the Texas Motor Speedway because I was just a dirt track kid from Oklahoma. (21) Christopher Bell, Toyota, 167. (12) Chase Briscoe #, Ford, 167. (5) Grant Enfinger #, Toyota, 167. (4) Ryan Truex, Toyota, 167. (7) Ben Rhodes, Toyota, 167. (10) Justin Haley #, Chevrolet, 167. (1) Noah Gragson #, Toyota, 167. (2) Johnny Sauter, Chevrolet, 167. (3) Matt Crafton, Toyota, 167. (6) Kaz Grala #, Chevrolet, 167. (16) Travis Kvapil, Chevrolet, 167. (15) Austin Self, Toyota, Accident, 166. (14) Timothy Peters, Chevrolet, Accident, 166. (22) TJ Bell, Chevrolet, 165. (19) Jordan Anderson, Chevrolet, 163. (13) Myatt Snider, Toyota, Accident, 160. (26) Norm Benning, Chevrolet, 157. (11) Cody Coughlin #, Toyota, Engine, 153. (25) Jennifer Jo Cobb, Chevrolet, 150. (23) Wendell Chavous #, Chevrolet, Electrical, 143. (8) John H. Nemechek, Chevrolet, Accident, 137. (18) Stewart Friesen #, Chevrolet, Accident, 116. (17) Tyler Young, Chevrolet, Engine, 111. (24) Todd Peck, Chevrolet, Vibration, 39. (9) Austin Cindric #, Ford, Accident, 28. (28) Josh Reaume, Chevrolet, Engine, 12. (20) Kevin Donahue, Chevrolet, Electrical, 9. (27) Tommy Regan, Chevrolet, Electrical, 5.